SACRAMENTO, CALIFORNIA (March 13, 2018) – Madera Speedway’s busy spring continues with the opening round of the 2018 Pacific Challenge Series presented by PenneyLawyers.com on Saturday evening, with 75 laps of Super Late Model action on tap. It will mark the sixth series appearance at the popular one-third mile speedway. PCS Super Late Models will be paired with the potent Western Winged Sprints and USAC Western US Midgets providing fans with plenty of open wheel racing as well. Modified Super Toyotas, F4s, and a Jr. Late Model exhibition race round out the busy card. Parity has been the name of the game in the PCS for several seasons including six first-time winners in last year’s series. Carlos Vieira won the Madera season opener for his first career win. 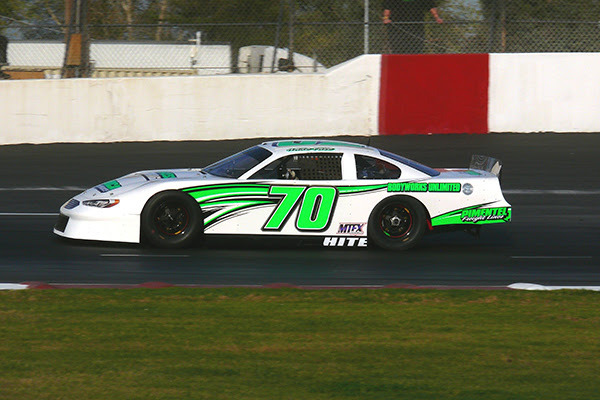 Popular Late Model and tour car standout Jacob Gomes has two career PCS wins – both at Madera. Modesto’s Mike Beeler narrowly topped Granite Bay’s John Moore to grab the 2017 championship. 2015 Rookie of the Year Cole Moore finished third with one victory while two-time winner Matt Wendt, the 2016 Rookie of the Year, was fourth in the final rundown. 2017 Rookie of the Year Jack Wood was unable to grab a win but still finished fifth in the championship ahead of his cousin Travis Milburn. El Dorado Hills’ Jason Romero, Valley Springs’ Tracy Bolin, Elk Grove’s Mike Hite, and Pine Grove’s Matt Scott made up the rest of the top-ten. Other winners included Derek Copeland at Shasta, Jeff Bischofberger at Stockton, and Randy Hedrick at Ukiah. Saturday’s show will be run as an early season “matinee”. Friday practice will open activities with pit gates opening at 3 pm and practice from 5pm – 8pm. On Saturday, pit gates will open early at 10am with practice running from 11am -1:15pm. Qualifying will follow. The American Racer Tire dash will be at 3:15 with main events to follow. The 75 lap feature is the final race scheduled for the exciting evening, tentatively going green at 5:30pm.